Based on information from the source, this image is believe to be in the public domain. It is up to the user to make their own determination. Additional information is provided below, usually the entire online file, to assist you in doing so. Public domain images SHOULD NOT BE ATTRIBUTED TO PINGNEWS. Please attribute the repository and the originator. If you can add "via pingnews" or a link back to this site it is appreciated. While it may appear with this image, the attribution license does not apply to pingnews in this instance as we are neither the creator of nor the archive for this work. 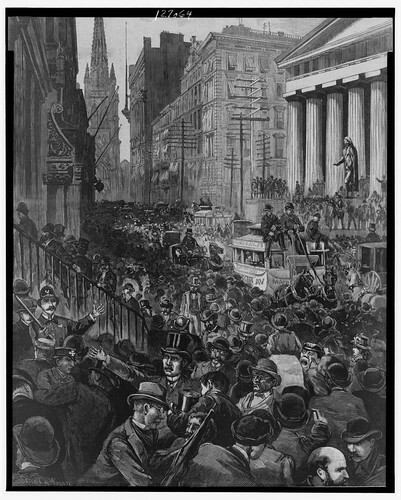 TITLE: The panic - scenes in Wall Street Wednesday morning, May 14 / drawn by Schell and Hogan. SUMMARY: Crowd on street, New York City. Illus. in: Harper's weekly, v. 28, no. 1431 (1884 May 24), p. 333.
Business panics--New York (State)--New York--1880-1890. Stock exchanges--New York (State)--New York--1880-1890. Wall Street (New York, N.Y.)--1880-1890.